Brown was on the telly last night but Blair was in my moth trap: Blair's Shoulder Knot, one of a number of moths which signal the arrival of autumn. It's also one of a trio of moths named for an assiduous doctor on the Isle of Wight (rather than the former PM). Blair's Wainscot and Blair's Mocha are the others which he discovered in the 1940s. Why so late in the history of entomology? Well, Blair's Shoulder Knot certainly wouldn't have been found in Leeds in those days, nor in many other parts of the UK. It is a modern success story (how I like such counters to the currently fashionable eco-gloom!) Arriving on Dr Blair's southerly doorstep back then, it has spread North vigorously and is now common here. Mind you, it may be because its caterpillars like that curse of the British garden landscape, the leyland cypress. Blair's Shoulder Knot is also a classic example of a 'small grey moth' which proves much more interesting, and beautifully patterned, on closer inspection. Double click twice on the picture to see if you agree. Two other autumnal visitors were in the trap too: a Rosy Rustic and (bottom picture) a silvery-grey November Moth. It has got its dates wrong but is very welcome, as a species which I haven't recorded here before in five years of trapping. I nearly didn't bother with the trap last night. Of course, that's always when things happen. I went through the eggboxes this morning almost in automatic mode, clucking at the absence of anything bar a Silver Y, two Black Rustics and the last of the tattered army of yellow underwings. Then I discovered this: a very fine Red Underwing, a moth I last saw here in Leeds more than ten years ago. It was during the day on that occasion; the beautiful creature astonished us by zooming into the garden when we were having tea outside. It's also the same species as the lovely moth Penny and I found at Radstock Bridge earlier this summer, also during the day (see entry for 8 August, below). This one is in such excellent condition that it must have hatched a lot later, perhaps due to the marginally cooler climate here, compared with the upper Thames valley. For scale, I've pictured it with two models from the opposite ends of the Russian political spectrum in 1917, brought back by P and her Mum from a visit to St Petersburg. The moth ignored them but sleepily allowed me to push a forewing gently forward with a teaspoon, to show the vivid, hidden colour which gives it its name. The end is almost nigh; I think I will close things down for this year at the end of the week. Even the yellow underwings are dwindling; the catch at the moment consists of assorted small carpets, tortrix micro-moths and Silver or Plain/Beautiful Golden Ys. And Black Rustics, such as this one which was in the trap last night with half-a-dozen relatives. It really is a handsome moth, but you don't normally get to see its underwear - sorry, underwings - as in this case. I tried to get it to show more, as the bishop said of the actress, but it wasn't having any. After a while it recovered from the soporific effects of the lamp and hurtled away. 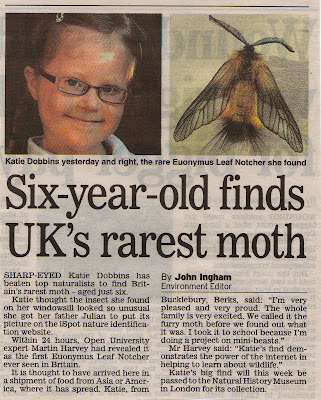 I shouldn't be making these dodgy remarks about knickers, however, since the white underwing is only found in males. The female Black Rustic's are more dusky. One more holiday despatch and then we'll be back to trapping in Leeds. Mind you, I don't envisage more than a week or so before the season ends, because it's getting cold and also dark in the morning when I sally forth, camera in hand. This picture is of Lyme Regis; a very small part of the path through the pleasant linear park above the harbour, beach and Cobb. My Mum and I were pottering along enjoying the flowers when we saw this caterpillar. Unusually, it was going round and round in circles, not at all like the purposeful Peacock catties I mentioned on 6 July (all heading across a cycleway in Richmond, North Yorks, in the same direction and at exactly the same angle). I knelt down to take the photos, attracting a certain amount of interest and thus spreading the moth word. Mum was more concerned to shepherd it to safety, which is what we then did. It's what we used to call a 'woolly bear' when kids, but that's very unscientific. My best guess is a Buff Ermine but please put me right if I'm wrong, gang. More signs of the prevalence of butterflies and moths as symbols or decoration: further south on our holiday probe, another of my small cousins, Anna, came dashing back into the bar at the King's Head in Ruan Lanihorne ( a lovely hamlet in Cornwall) and said; "there's a butterfly in the ladies." This was one place I could not venture, in spite of the fact that I have stalked butterflies in the Victoria Falls gorge and at the top of Mount Poniki in Sulawesi, Indonesia. 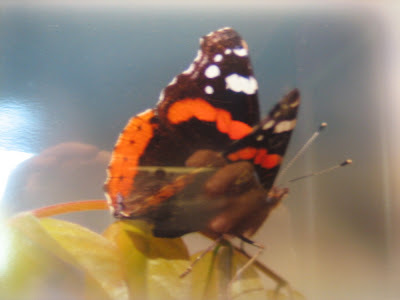 I handed over the camera, and back she and her Mum came with this fine picture-of-a-picture of a Red Admiral (above). The nearest thing we had in the Gents was this stylised bee; one of a collection of regimental badges on old cigarettes cards. A very fine pub; and back home afterwards, Anna found this Speckled Wood, seen here both displaying (below) and in hiding mode (above left). Note how the hiding one has positioned itself so that its shadow is minimal. I've been away in the West Country, terrorising relatives with my Mum on her late summer holiday. A highlight was Bristol Zoo where my two young cousins Robbie and Alfie took these excellent pics in the Butterfly House while Mum and I admired the Davidia or Pocket Handkerchief Tree (which has an offspring in Leeds, grown from a nut collected in Bristol Zoo about 15 years ago). The first butterfly is a 'glasswing' whose camouflage involves being transparent. The CD-like thing on which it is perchd is a nectar dispenser; disgracefully spoilt, these captive butterflies. Robbie and Alfie's family and I had deep discussions about whether it would be possible for an entire moth to become transparent like this; or indeed an entire human being, as in H G Wells' The Invisible Man. We couldn't see why not, although 'glass humans' might look rather offputting after meals. Needless to say, there is some interesting science about this online, for example on http://scienceray.com/biology/zoology/almost-invisible-the-incredible-glasswing-butterfly/. From this, I also gleaned the fact that Glasswings are from South America and have the unusual and satisfactory scientific name of Greta oto and the even better Spanish one of espejitos, or 'little mirrors'. The middle pic shows a butterfly which seems to have latched on to op art or dazzle camouflage as a way of changing its outline. 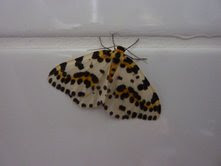 I'm rather proud of my detective powers; I guessed at its name, put 'zebra butterfly' into Google and bingo! It has another defence mechanism: the ability to make a sinister creaking sound with its body when disturbed. 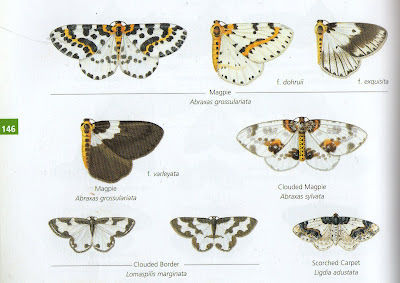 The last example, below, is an Owl Butterfly, like the other two a native of the Americas. I know it's blurred, but to me that suggests rather well the way its deterrent camouflage (rather than hiding camouflage) might appear in action to a predatory bird. Off-putting. Here are two carpet moths discussing National Moth Night, which falls tonight and tomorrow. I think they are as baffled as I am. They may, of course, actually be talking about Understanding Egg Codes which, as you can see, is among the subjects raised in the impressive amount of text you get printed on eggboxes. One of these days, someone will start serialising a novel on them. Or should that be done on cereal boxes? ho, ho. 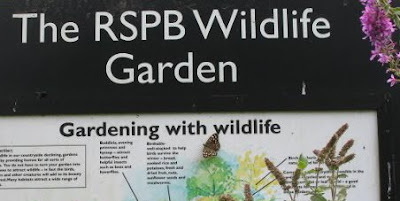 Anyway, it's a puzzle as to why the excellent group Butterfly Conservation chooses mid-September for this laudable exercise because round here, at any rate, moths are getting a bit sparse. Maybe it's because they've released a few thousand marked moths, painted with a dot of harmless colour, and we are all being asked to look out for these in our traps. With fewer moths around generally, they may be easier to spot, and at least the inundations of yellow underwings, which sap my enthusiasm for picking carefully through the catch, are easing off. So if you see a moth with a coloured dot in the next few months, let Butterfly Conservation know - www.nationalmothnight.info. Your record will help build up migration patterns which ringing has made so comprehensive and interesting for birds. We brought a small, butterfly-souvenir back with us from Edinburgh, a wonderful city but one where I didn't encounter any real butterflies or moths. Product placement is about to be allowed on ITV, so I've decided to permit it here: this is part of a really nice range of women's clothes available at a Scottish store called Ness. They do a modern take on the traditional tartans and tweeds, and very successfully. The butterfly button is on a bright blue cardigan Penny bought, along with an even nicer, softer blue jacket which was in the sales (Yorkshire meets Scotland, a warm and thrifty alliance. Check them out on www.nessbypost.com if you can't get to the Royal Mile (two outlets), Leith or St Andrews. You can look just as bright as a butterfly. Sorry one photo's rather dark and the other over-flashed. We had a rather late-night modelling session which I may try to repeat today, although truth to tell, I rather like the contrast. As for product placement, I remember when I was on the London Evening Standard, the guileful cartoonist Jak, ised to do it all the time. The second generation of Snout moths is arriving in the trap at the moment, particularly when I put it in long grass as I did last night. They make me smile, with their curiously long, upturned palps, which give them their name. These are used for feeding and perhaps more importantly sensing a range of things, which may help the moth to 'steer'. Why one species has such distinctively long ones is one of the many things I have yet to find out about moths. My teetering pile labelled 'Retirement Projects' grows ever larger... The Snout is also distinctively shaped when at rest, with its wings sweeping back like a Vulcan bomber. I was driving down the A1 years ago, when a Vulcan swept low across the road to land at one of the Lincolnshire airfields - Scampton, I think, home of the Red Arrows. So now I know what a whitefly or something similarly-sized must feel like when a Snout moth zooms overhead. It was pretty chilly last night and the number of moths in the trap was the lowest since May. A Black Rustic and a Beautiful Golden Y, a score of increasingly tatty yellow underwings and a few dozy wasps.The micro wasps kept their little flag flying, however, including these three. I shall drink my early morning tea in the company of one of the excellent online micro sites, and return with whatever findings my notoriously limited powers of observation can manage. Note that the one above has decided to roost by the L for Large sign on the eggbox, which also conveniently gives you an idea of scale. It's very interesting to click on the pics and thus make them much vaster. The micro at the top, magnified in this way, looks like an elderly member of the House of Lords; the similar but much more battered one at the bottom right, shows how moths gradually lose their scales as their short and precarious life goes on. We've been at a wedding in Edinburgh - all go in the marriage world just now, with our own elder son's lovely festivities the Friday before. The moths seem to have caught the social habit. They don't cosy up much in the trap usually, apart from the yellow underwing huddles in the eggbox cones. But this yellow underwing and the Black Rustic seem to have something going. The Black Rustics are extremely handsome and they have started coming in numbers. My moth Bible says that they like ivy and ripe blackberries and we have loads of both. Here's another Red Admiral, seen less than a week after the tattered old veteran I showed on 3 September. What a difference. The contrast makes the point about the different generations of some butterflies. Like us, Red Admirals keep breeding in the summer, so that a pensioner such as the one at Addingham can be flying at the same time as a beautiful youngster in her equivalent of the twenties, like this one. There are plenty on the buddleia still and quite a few have the lovely white fringe which marks a recently-hatched butterfly (or one which has been lucky enough to lead a quiet life), as in this case. 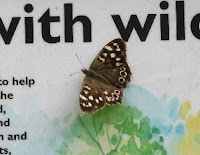 More evidence that butterflies and moths can read, meanwhile. Veteran readers will know of my fascination with the way moths go for the barcode on the eggboxes in the trap. Here, Andrew Turner from Northampton has kindly sent me these pics of a Speckled Wood examining details of the excellent Ryton Organic Gardens in Warwickshire (www.gardenorganic.org.uk/gardens/ryton.php). Our son's wedding was in Warwickshire, between Leamington Spa and Warwick, and I was most impressed by the gentle countryside (and also the Red Lion at Hunningham (http://redlionhunningham.co.uk/?page_id=43) and the Hilltop Farm shop in the same village (www.hilltopfarmshop.com/) Goodness, this is like a tourist brochure, but why not? As for my title, fellow readers of Hornblower long ago may recognise it. I was always fascinated by the gradations of Royal Navy admirals, based on the red, white and blue of the national flag. The butterfly's name, however, is an elision of the original 'Admirable', like 'Elephant and Castle' which supposedly comes from Henry VIII's campaign to blacken the name of his first wife Catherine of Aragon, aka the Infanta of Castille. I had a puncture yesterday for the first time in four years. I discovered, as a result, that my Guardian car doesn't have a spare tyre - just a bottle of latex and an electric pump which was of no avail against the tear in the tyre wall. My frustration was relieved by discovering this caterpillar on the roof of the car while I waited for the AA (who came very quickly, I might add, and ATS in Bradford did a great, speedy tyre replacement too). The car in the picture isn't mine. Morris Travellers sensibly did have spare tyres. I added it for scale. It's Matchbox rather than Dinky, I should add. Does anyone know what the caterpillar is? I am checking in my usual rather purblind ways through my various books and online, but there seem to be an awful lot of green caterpillars like this. 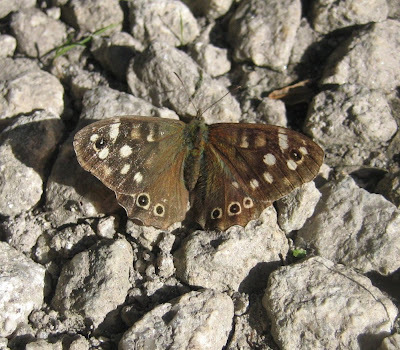 I wondered about the Speckled Wood, which has featured much in this blog, but I don't think it's quite right. I kept it overnight but it clearly wasn't happy in captivity, in spite of lush helpings of privet, grasses and willow. It crept as close as it could to the lid of the plastic raspberry box and was gripping on firmly by its fork-shaped tail (see detail). So this morning I liberated it into the wider world again. Wasps are abroad at this time of year. The social structure of their nests is breaking down and many are on the loose. Their disorientation after a life of fascist-like order must be made worse by my powerful light. Dozens are dopily stuck in the trap in the morning. Sometimes they attack the equally sleepy moths but mostly they ignore them. Look how they try to maintain group solidarity. The first picture shows a little band somewhat dispersed after I lifted the trap lid. The second, a minute or so later, has them huddling together. For reassurance? Defence? It would be interesting to know and I will Google 'wasps' later today. I didn't get stung, incidentally, although one wasp came into the kitchen on my dressing gown and watched me making early morning tea. Meanwhile, I was interested in this dead Large Yellow Underwing. Ooh what big legs you've got, as Little Red Riding Hood might have said. You seldom see moths' legs unfolded to their full extent.